Raith Supporters Trust » Blog Archive » Raith supporters place their trust in Gary Locke! Raith supporters place their trust in Gary Locke! 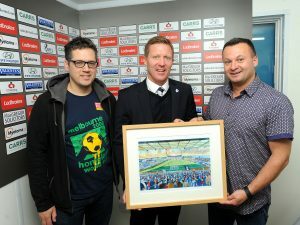 Following the stirring derby victory over Dunfermline Athletic recently, Trust board members Steve Wallace and Alan Russell met with Gary Locke to welcome him to the club, congratulate him on the afternoon’s victory, and present him with a framed print of James Muddiman’s iconic painting of Starks Park. Gary assured us that the print would be taking pride of place on the wall of his office in Starks Park, and we wish him a long and successful reign in Kirkcaldy. Ian Jenkins liked this on Facebook. Bryce Phillips liked this on Facebook. Roddy Maclean liked this on Facebook. Colin Flinn liked this on Facebook. Fraser Hamilton liked this on Facebook. Niall Russell liked this on Facebook. Jennifer Ogg liked this on Facebook.